Miracle on 34th Street teaches the power of belief. One of my favorite Christmastime movies is the classic Miracle on 34th Street (1947 version) starring Natalie Wood (Susan Walker), Edmund Gwenn (Kris Kringle), and Maureen O’Hara (Doris Walker – she works at Macy’s in New York). I can watch this movie over and over again. I prefer the black and white version. The Technicolor one looks funky. Now that Christmas 2012 is in the past, and we’re now in 2013, it’s a good time to reflect on the previous year before making goals and resolutions for the up and coming year. If you don’t reflect on 2012, you’ll repeat the same self-sabotaging patterns and beliefs. I like to read my horoscope for fun. Most of the time my horoscope is off, but sometimes, it’s spot on. “Well, Leo, did you wake up on Christmas morning to find that Santa Clause left everything you wanted under your tree? If not, don’t take offense – Santa has an ulterior motive. The biggest gift you have yet to receive this holiday season is the gift of belief. You need to learn how to believe in yourself. You need to believe that all things are possible. You need to know that things are getting better for you at this very moment, and they will continue to do so despite how it appears. Keep the faith” (horoscope is from the DailyHoroscope app from BlackBerry). It sounds simple that all I have to do is change my belief system, but it can be a complex process, especially if you tend to lean more towards logic than intuition. Let’s face it; logic is easy and can be explained. You can see and touch it. Intuition relies on “believing before seeing,” something most of us were never taught to do. During the year of 2012, I needed the gift of belief. In fact, it’s been a common theme for my life for the past two years. Perhaps, it’s been theme for you throughout the years as well. Below are seven lessons from Miracle on 34th Street that you can apply to your life right NOW. Make 2013 and future years Happy New Years! 1. There’s power in belief. Susan wants a house for Christmas; a house with a big lawn and tree swing in the backyard. She gives Kris Kringle a picture, and he’s unsure, for a moment, if he can get it for her. This challenges her ‘delicate’ belief system. Kris asks Susan, “May I keep this picture?” Susan allows him to keep it. You’ll have to watch Miracle on 34th Street to see if Susan gets her house. Believing is seeing. You must BELIEVE you can have (fill in the blank). You must BELIEVE you can be and do (fill in the blank). Remember, seeing is not believing. You must believe first and then you’ll see (fill in the blank). Sadly, Kris Kringle is put on trial to prove he’s Santa Claus thanks to Mr. Sawyer, who gives Kris psychological tests, and takes offense when Kris questions his mental health. Kris also takes offense that Mr. Sawyer has made Alfred (a Macy’s employee) believe he’s mentally ill because he’s generous and kind-hearted. FRED: You don’t have any faith in me, do you? DORIS: It’s not a question of faith. It’s just common sense. FRED: Faith is believing in things when common sense tells you not to. Towards the end of Miracle on 34th Street, Doris, Susan, and Mr. Gailey attend a Christmas party thrown by Macy’s. Susan runs to the Christmas tree to see if there’s a note or picture indicating that Kris Kringle got the house she wanted. She doesn’t see anything about the house. Her mother consoles her and tells her to “have faith” in Mr. Kringle. Susan agrees to keep the faith, even though she didn’t see anything under the Christmas tree about the house she asked Mr. Kringle for. 3. It’s possible to find love, again. Doris is a single parent; she divorced Susan’s father when Susan was a baby. Mr. Gailey is fond of Susan and her mother, but Doris is to hurt and absorbed with work to notice. Her heart has been closed for many years, and she can’t see that a good man and father figure is right in front of her. If you’ve suffered heartache from divorce or long-term relationship, keep your heart open so love can find its way in again. Heal your pain and learn whatever lesson you had to learn. You can find the gift in heartache, if you look for it. And, you won’t make the same mistakes in your next relationship as you may have in your previous one(s). 4. Make the children happy. Kris Kringle is hired as a last minute Santa Claus because the one Doris hired for the Macy’s Thanksgiving Day Parade is drunk. The crowd loved Kris and he’s hired to work in the department store for the holiday season. Kris believes it’s important to make the children happy. He tells a little boy he’ll receive the red fire engine he’s asked for. The little boy’s mom isn’t happy about this and informs “Santa Claus” that Macy’s and other stores don’t have the fire engine. Could you imagine if sales associates sent people to other stores? Then again, with the internet, you can shop from home! Making the children happy is a wonderful lesson. Children don’t have to live in a fear based world that’s and filled with angst and turmoil. We can make sure they’re happy and give them a world filled with love, peace, and happiness. 5. Spend the holidays with the ones you love. Years ago my family had over 30 people over for Christmas. Not anymore. My dad got sick in 2001/2002 and my mom stopped having Christmas because it was too much, and my dad didn’t want all of those people over since he was sick. My dad passed away in 2004 and the holidays have changed. Kids grow up and family relationships change. People have their own lives to lead. Whatever you do, make sure you spend the holidays with the ones you love and cherish. There’s nothing wrong with going away for the holidays, or asking family members to share the responsibilities because holidays can become expensive. For example, my mom and dad spent close to $500.00 every year on Christmas Eve. This includes food, drinks, and gifts. I’m not sure if my relatives appreciated it. 6. Learn the law of giving and receiving. If you want to receive, you have to give for the sake of giving. If you give to ‘get,’ you won’t receive anything at all. There’s nothing wrong with receiving; it’s a part of the law of giving and receiving. When you give, you receive what you give. The next time someone gives you a compliment, receive it. Say, “Thank you.” Don’t downplay the compliment. Give thanks for it. When you give your time, money, etc., give with an open heart. Don’t expect anything in return because you’ll sabotage the spirit of giving. Give because you want to give and you’ll receive in return. 7. Imagination is a gift, use it. Susan’s a proper young girl who’s never heard of fairy tales; she doesn’t believe in Santa Claus or the Easter Bunny. Doris, Susan’s mother, doesn’t believe in reading her daughter fantasy stories because they’re not real and will break her heart. Of course, Doris’ heart was broken by her ex-husband who turned out to be nothing like Prince Charming. Kris gives Susan a lesson in using one’s imagination and teachers her how to act like a monkey. It’s a good thing Doris didn’t know about this. She probably would have had Kris committed to Bellevue sooner! Your imagination is a gift, use it. Visualize yourself running your own business. Imagine becoming a New York Times Best-Selling author, or donating millions of dollars to your favorite charity. How do you feel? How do you look? Your imagination can take you places you didn’t know you could go. Start using it before it’s too late. Before you embark on making your goals and resolutions list, refer back to this post if you want 2013 and future years to be blessed. Don’t repeat the same self-sabotaging beliefs and patters of the past. Break the cycle once and for all. If you want a blessed life, you must believe and have faith that you can live a blessed life. Give for the sake of giving, but open your arms to receive. Love with all of your heart and spend time with the ones you love. 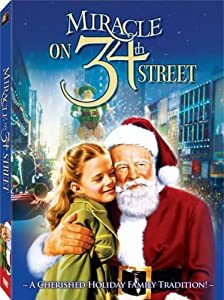 Do yourself a favor and rent or buy Miracle on 34th Street. It will be money well spent!